No pain here! Harold is living his best life. What would you do if you unexpectedly found internet fame in your 70s? It happened to András Arató, the Hungarian lighting engineer who’s known around the world as smiling stock-photo model “Hide the Pain Harold,” and he’s just enjoying the ride and living his best life.Arató just visited one of his favorite cities, Manchester, England, and his appearance was such a big deal in town that the football site Dugout made a video about it. Harold, an avowed football fan, had his pick of teams to watch when he arrived in Manchester. And, sorry, Man United, but he went with the boys in blue. 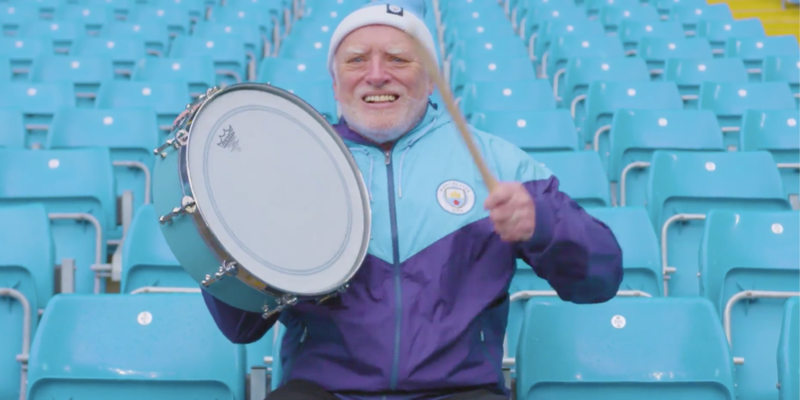 Check in with Harold as he attends his first Man City game, scarfs down some fish and chips, has a couple of pints, and does everything else Mancunians do. It is, in a word, adorable. Harold recently told the Daily Dot that, although he’s proud of other accomplishments in his life, he’s come to like and embrace his meme status. It really shows in the Manchester video. He’s an obvious good sport giving a master class on how to have fun and play along with your internet fame, and anyone who finds themselves in his situation would do well to pay attention.